You may wish that there was a solution or cure for stretch marks you already have, but the truth is, outside of improving the appearance of them a bit, once you have stretch marks they are permanent. This means the best thing to do is to prevent them in the first place! It’s true that genetics and hormones play a role in whether or not you get stretch marks (so does epigenetics), but it’s also true that your lifestyle plays a significant role in your skin health and stretch mark development. Eating the way I recommend here does not guarantee that you won’t get any stretch marks, but it will improve the integrity and elasticity of the dermis layer of your skin (where stretch marks occur). In other words, you may not end up with stretch-mark-free skin, but I’m confident that the methods and foods I list here are known to act in the body in ways that do not promote stretch marks and can, in fact, prevent them altogether. People often get new stretch marks at times in life when they gain a significant amount of weight in a short period of time, or during adolescent growth spurts. It’s best to improve the elasticity and structure of your skin well in advanced of your weight gain or growth spurt–more time equals a higher chance that you’ll avoid stretch marks! Stretch marks occur at the dermis layer of skin (the middle layer), and they happen when the skin is stretched further than it has the capacity for. This causes tearing in the tissues, generally purple or red in color at first, but they may fade to white or a lighter color over time. It’s not just stretching that causes stretch marks–it’s stretching the dermis beyond what it can withstand. The goal of eating specifically to prevent stretch marks is to increase the level of stretching the dermis can withstand. 1. Gelatin – It is often said that the collagen content in gelatin is directly related to skin health. The truth is, consuming gelatin is a long-term fix for skin elasticity. The collagen content likely does help, but it’s more likely that the larger preventive effect comes from the overall nourishment and health effects of gelatin on the skin. That said, gelatin is purported to improve skin health overall. I believe it–it’s made of amino acids, high in glycine, and supportive of healthy cell metabolism. You can consume gelatin in its powdered form (either the kind that “gels” or the kind that dissolves and doesn’t “gel”), or you can consume it in foods like homemade bone broths (chicken feet are super high in gelatin–throw them in your broth!). There’s no specific amount you “should” eat to get the effects you want, but gelatin is a very safe food and it has many other benefits too. Consuming gelatin everyday is perfectly healthy and reasonable. Consider at least one tablespoon of the powder per day or a couple servings of bone broth. 2. Foods high in antioxidants,vitamins C, A, and E, specifically, are related to the nourishment, healing, and health of the skin. These foods have an anti-inflammatory effect and also reduce free radicals in the body and skin, helping the skin maintain it’s elasticity and firmness. Vitamin C is specifically related to collagen formation, and collagen health is directly related to skin elasticity! My recommendation is to take note of the foods high in Vitamin C, Vitamin A, and Vitamin E, and then incorporate some of them into your diet everyday. You can also safely supplement with Vitamin C and E quite easily, and Vitamin A in the form of fermented cod liver oil. 3. Coconut Oil, Butter, and Olive Oil – Foods High in Saturated and Monounsaturated Fats have been shown to improve skin elasticity, probably because elastic fibers and collagen require fat to be nourished and healthy. I recommend using the highest quality sources of these fats you can find. Consuming at least 3-4 Tablespoons of these fats per day can have beneficial effects on your skin. Note: many people will promote using coconut oil as a skin lotion, and this is good for you, but putting oil on your skin won’t prevent stretch marks because it does not penetrate deeply enough to reach and nourish the dermis. It does feel nice though! Fish Oil – the omega-3 fatty acid content is not only nourishing to the skin, but it also helps to balance out the body’s omega-3 to omega-6 ratio. This leads to an anti-inflammatory effect in the body, which is supportive of healthier and more elastic skin. (The standard American diet is highly inflammatory–full of white flour, sugar, poor quality fats, etc.). Conceptually, you could also consume fatty fish a couple times a week in order to get the positive skin effect, but this hasn’t been specifically studied. 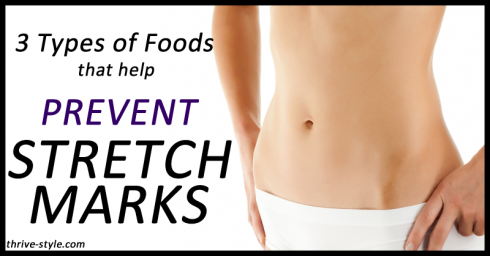 Have you had stretch mark prevention success through your food choices? I’m currently entering my third trimester of pregnancy, and I’ve been pretty consistent with my gelatin intake (4 Tbsp a day on most days), as well as with my fermented cod liver oil (2 tsp a day on most days). I’m focusing more now on adding in a bit more coconut oil (but I definitely have eaten my fair share of butter!). I am trying to eat a lot of veggies and some fruits to get more antioxidants, and I’m contemplating taking a vitamin C supplement for the next several months for many reasons (skin health is one, but also for its healing properties after birth). I don’t have any stretch marks yet–I know they often show up in the third trimester when the most stretching occurs! We’ll see what happens, but I do feel good about my nutrition choices overall so far. Price, Weston A. Nutrition and Physical Degeneration: A Comparison of Primitive and Modern Diets and Their Effects. Oxford: Benediction Classics, 2010. Davis, BC, Kris-Etherton PM. “Achieving optimal fatty acid status in vegetarians: current knowledge and practical implications.” The American Journal of Clinical Nutrition. 78. Suppl (2003): 640S-6S. Next post: March Giveaway: Real Food Starter Kit!